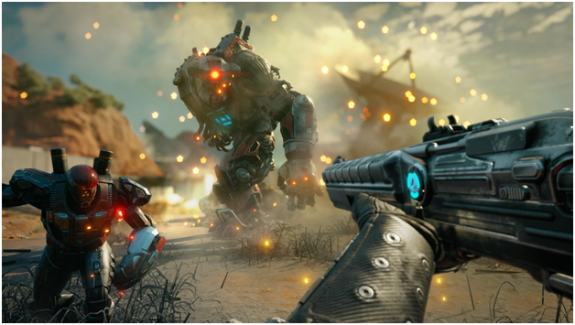 While the first part was rather linear, Rage 2 is a real Open World game. Right off the bat, you can get a Rage 2 Key from GameGatoraswell! To make it work, the Doom developer id Software got support from the Avalanche Studios for the second part. They have already developed the Just-Cause-series and are therefore one of the best contacts in Open World. Despite the freedom in the open world, Rage 2 still wants to tell a gripping story. It starts a few years after the Cliffhanger end of the first part. The world has recovered a little from the consequences of the asteroid impact, which is why the desolate desert landscapes are now permeated by much more vegetation and life. So green the vegetation, so sweet your revenge, because in Rage 2 the Ranger is driven by exactly this. His mother was killed by General Martin Cross and that does not leave the good of course on itself sit. Oh yes, and of course that Ranger is you. In contrast to the predecessor, this time your character also has a voice, and one or two familiar faces from the predecessor, such as the old Doctor Kvasir, are also involved. 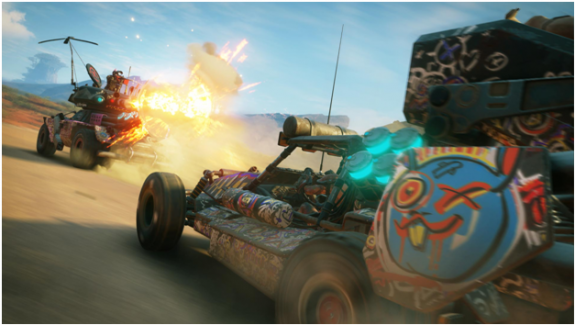 Rage 2 wouldn’t be a game from id Software if it weren’t for the fact that all the pipes weren’t blown and thank God that’s exactly the case again. The fact that the same team has already worked on Doom and Wolfenstein is immediately apparent in the game, because the shootings feel as fantastic as ever. The sound design is right, the recoil is powerful and comprehensible, and the opponents who are hit realistically go to the ground. Nevertheless, the show is so exaggerated and comic-like that it doesn’t get unpleasant or tasteless. In addition to foot fights, you’re also on the road in various vehicles, from which you can of course fire one or two bullets and rockets. Speaking of driving: While you are shooting, your Overdrive automatically charges up. If you activate it, it makes you a superhuman enemy for a short time. But even without Overdrive you are not defenseless. This gives you up to four activated abilities that allow you to move back and forth between enemies or shake the ground with energy boosts. When the battle is over and your iron has cooled down again, you can not only steal ammo from your fallen adversaries, but also all kinds of resources. Because even in Rage 2 you have access to a crafting system to make everyday life in the wasteland more varied. And the wasteland is so much more than just sad grey and brown from the start. The world is surprisingly colorful and streaked with neon colors. Especially in overdrive mode, the rainbow lets its muscles play. The denser vegetation compared to its predecessor also contributes to this impression. If this got you as hyped as us, make sure to check out the Rage 2 Deals on GameGator!